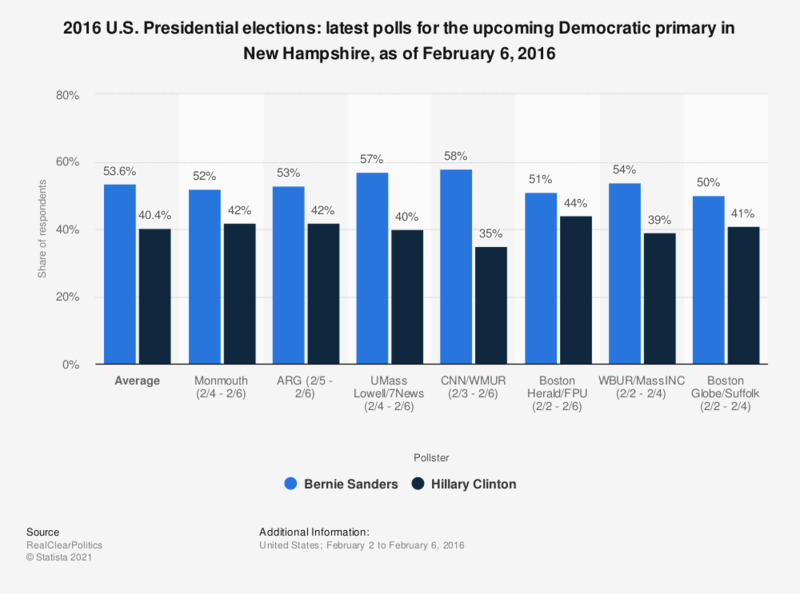 This statistic shows the latest polls on the Democratic primary that is to be held in New Hampshire on February 9, 2016. As of February 6, 2016, Bernie Sanders led the polls with about 54 percent of voter support. Hillary Clinton had an average of 40 percent voter support. Speculation regarding the 2016 presidential elections in the United States began immediately after the 2012 elections. For some candidates, such as the Democrat Hillary Clinton, the candidacy has been in the making for more than a decade. In the 2008 presidential elections, she was the first woman in the United States history to be nominated by a major party. At the time, Clinton, a Yale Law School graduate, already had extended experience in politics due to her eight years as a New York senator, between 2001 and 2009, as well as due to her role as a First Lady during the two terms as president of her husband, Bill Clinton, between 1993 and 2001. Although at first she was leading in opinion polls regarding the Democratic nomination, the platform of change on which Illinois senator Barak Obama was running quickly started gaining popularity among voters. Clinton placed third in the 2008 Iowa Democratic caucus, but defeated Obama in the New Hampshire primary. After a long battle in the following months, she eventually ended her campaign and endorsed Obama in June and went off to become a Secretary of State in his administration. Following Obama’s reelection in 2012, Clinton’s candidacy was widely expected, prompting many media outlets to play a game of “will she run or won’t she run?” although she had repeatedly denied making any official promises. As it turned out, she is running, as announced in a video message released in April 2015. Hillary Clinton’s biggest rival in the race for the Democratic nomination is Vermont Senator Bernie Sanders, whom she defeated in the February 1st Iowa caucus by a very small margin - 49.8 percent versus 49.6 percent of the votes. Sanders, a self-described democratic socialist who, prior to his stance in the United States Senate, has also been a member of the U.S. House of Representatives between 1991 and 2007, as well as mayor of Burlington, VT for an additional seven years. His liberal stance on social issues such as LGBT rights, abortion and the death penalty, to only name a few, have made him extremely popular especially among younger Democrat voters. The third Democratic candidate to have made it to the primaries is Maryland Governor Martin O’Malley. However, upon winning only eight votes on February 1st, he withdrew from the race. The missing percentage points to 100 percent are divided among respondents who were uncommitted at that point, unsure, had no opinion, or refused to answer the question. Are you generally pleased with the selection of the candidates running for the Republican nomination, or do you wish someone else was running for president?